Pricebusters Saving Your Hard Earned Money: This Week's Sales and I've Got Lots of Bananas! This Week's Sales and I've Got Lots of Bananas! How's your summer going? Mine's great! It's been hot...which I love...a lot! I have been slacking on the weekly sales because I'm outside....always, every minute it's sunny if I can. I need sun lots of sun. My friend told me we are sun hoarders....yes...my name is Sue, I am a sun hoarded. So, right now I have the lap top in the shade while keeping my self in the sun. Just my hands are shady, it's perfect. I can write for long periods of time like this...sorry...Anyways, enough of that. Here's what happened this week. My sister in law and I took a trip to Quality Greens to get blueberries..10lbs for $9.99. While we were there we looked in the clearance, of course. 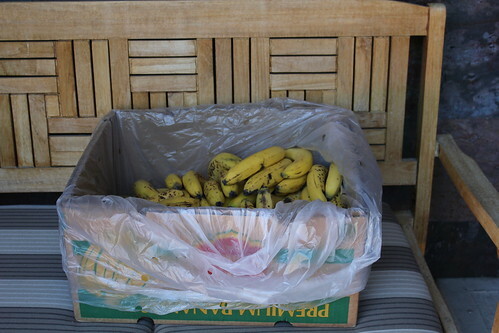 We found this box of bananas. $7. I asked the cashier if she would entertain me and weigh it. Almost 27lbs... .26/lb! There were some nice yellow ones in their too! We split the box and each paid $3.50. 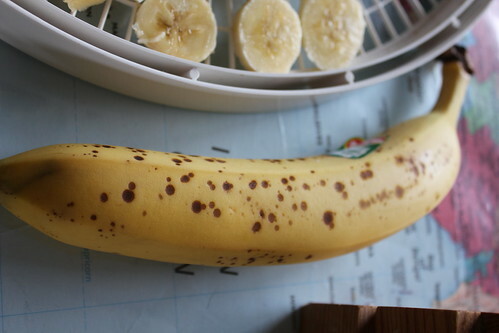 What did I do with all those bananas you ask? Even my food pics need to be done outside now. 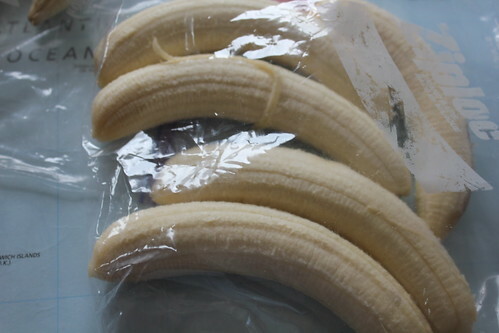 Some of them I just peeled and put straight into Ziplocs to freeze. I will use them for smoothies and banana bread and muffins. 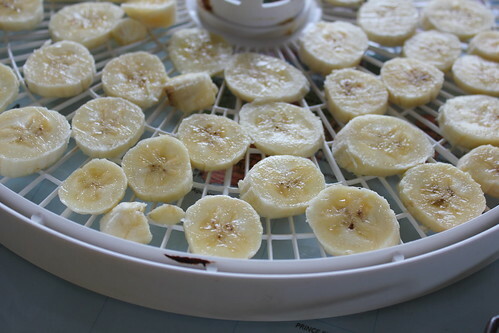 The ones that are spotted are sweetest and best for drying. I sliced them quite thin and dried them. It took about 8 hours. I kept some of the ripe ones and made a few loaves of America's Test Kitchen Banana Bread. It's the best recipe I have found so far! Note to self. I need to blog the recipe! This week at Safeway there are a few interesting deals. Buy 4 bags of chips for $10 and get a free 12 pack of pop! 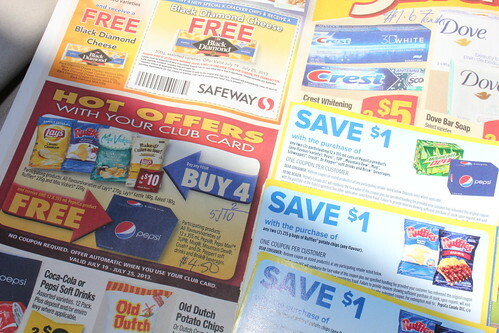 Don't forget to use the coupons from the Pepsico coupons. I found them in Superstore by the pop. There are $1 off on Ruffles and Pepsi products. If you use 4 of the Ruffles coupons you could get this deal for $8. 4 Bags of chips and a case of pop for $8 is screaming! 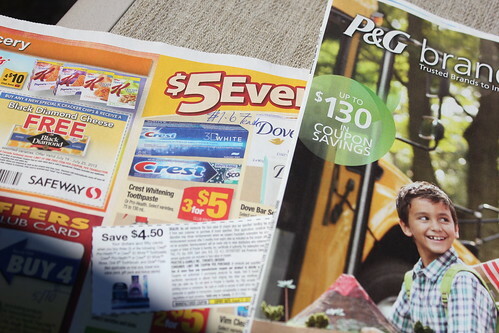 The new P&G Brandsaver is in our Event newspaper here today. They have three buy 3 Crest get $4.50 off. The Crest is 3/$5 at Safeway, so you'd get your toothpaste for .50 plus tax! Buy 5 Kraft Products get $5 off. The dressings are 2/$5 for the 475 ml. So 5 would be $12.50-$5=$7.50 for 5 which makes them $1.50 each. Make sure and watch to see the $5 actually comes off as I have had troubles in the past. Saving at the Movies This Summer!